When you hear the famous signature phrase “Yeah boy!," one can single out that it is no one other than iconic figure William Jonathan Drayton, Jr., alias Flavor Flav, who is a founder member of the 80’s rap group Public Enemy. The group gained mainstream success as they became one of hip-hop’s prominent group’s of the century. Respectfully, they became a force to be reckoned with. Hype man and rapper, Flavor Flav continues to leave an impression on his fans by wearing glasses, big hats and a large clock that dangles from his neck that is unforgettable to this day. Over the years Flavor Flav faced many challenges; however, he seemed to overcome them with personal strength and determination, and an everlasting belief in God. There would be greater endeavors ahead for Flavor Flav, as he kept the faith in his life. Eventually, he would become a popular television personality, appearing on The Surreal Life and shortly after starring on reality television shows such as Flavor of Love, which aired for three seasons, Strange Love, and Comedy Central’s Roastof Flavor Flav. Today, Flavor Flav continues to have multi-facet careers, making ways as a trendsetter and an entrepreneur as he recently announced his opening of Flavor Flav ’s House of Flavor, a takeout restaurant with quick service, located in Las Vegas. The restaurant is owned and operated by Flavor Flav. It will feature specialty foods and soul food recipes by the popular iconic himself, as well as decorations with Flavor Flav memorabilia. I had the honor to speak to such as individual who would make you laugh while delivering humorous comedy, and a charismatic individual with a unique dialog. Although, he is amusing, most importantly, he is very thought proven, conscious, and is here to share various counterparts of his latest happenings and insight about his restaurant to Consciousness Magazine. 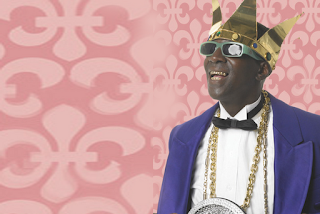 Here is what the iconic figure, Flavor Flav, had to say. Aaron Robinson: What prompted you to want to pursue a restaurant? Flavor Flav: Actually! To tell you the truth, I love cooking! Not only that, but hey listen man, I have a signature fried chicken that everybody needs to be tasting. I had a dream that one day that I was going to be just as big as KFC or even bigger. And in order for me to obtain that, I had a dream baby [that] I had to pursue. That’s what I’ve been pursuing right now. My partner, Farrah Gray, he bought restaurants in Las Vegas. He said, “hey Flav, you know what, I’d like to take this restaurant and open up the Flavor Flav House of Flavor.” This is going to be a takeout restaurant. You know what I’m saying! Also we got some nice signature sides to go with the foods. We got it going on right now family, word up! We got some collard greens, macaroni and cheese, mashed potatoes and gravy, cole slaw, and potato salad. Also, my partner Farrah added something special on the menu, which is called a red velvet waffle. We got shrimp on the menu. And also for all of the people that don’t like fried chicken, we going to have some baked chicken too as well. Yeah man! We gone get it in. Are you coming out to get some fried chicken? AR: [Flav] if I can ever make it down that way, I’ll come through and check you out. FF: Come on man! You gotta dawg! You gotta come through here bruh and get some of this signature food son. FF: And also just to let you know…being on this trip of chicken restaurants…because you know I had a restaurant out in Clinton, Iowa for FFC, Flav’s Fried Chicken. I had it shut down! The reason I had to shut it down was because the restaurant wasn’t being run right. The person that was running the restaurant picked the wrong handling to run the restaurant, and in order to win in the food game, you need consistency. FF: It wasn’t being consistent. I had to go up there and I had to shut ‘em down. But I’m going to open up another FFC and this one going to be in Detroit. The FFC right here is going to be the first of many FFC’s that I’m going to put around the United States. FF: Thank you, thank you! Yea man! I’m going to Franchise FFC. You know what I’m saying! The House of Flavor is just the take-out right now. Would we have another one? That determines…you know, me and Farrah would sit down and talk about it. We might put up another one somewhere. AR: When did you find the time to pursue culinary school? FF: Well, back in the days, when my family had a soul food restaurant, Soul Diner, I also went to school to take up cooking. I got a cooking degree. And also, um, I use to be at home you know, cooking and everything and doing my own experiments on my foods and stuff. That’s how I came up with my spices for my chicken. Another reason why I went and took up that culinary arts course is because back in those days cooks made a lot of money bruh. And I wanted to have a real good future with a career in cooking. Also, I wanted to be the first certified cook in the family. AR: Would you say your father’s restaurant was your inspiration? FF: I think that was an inspiration. Definitely, it inspired me to have that actually. AR: What are some of your expectations for the Flavor Flav House of Flavor? FF: My expectations are for this restaurant to do well. You know what I’m saying, cuz it’s a take-out only restaurant. I expect to just have fun with this. And…I want to make a lot of people happy through my food. AR: You, being an artist, a reality TV star…what do you believe is your key to longevity to sort of branch out and get into other entities? FF: Well honesty, you know, God man is good and he’s the one that gives me the power to be able to wake up and do what I do. There are a lot of people that go to sleep at night and don’t wake up like we do today. But I thank God first of all for everything that he’s given me and even putting people like you in my life. You know what I’m saying! That’s part of the key. The second part of that key is, people like you man. And people that support me…people like you that are in the game. That’s the key right there to the longevity. And also just being a positive person and just being yourself. AR: Definitely, definitely! As a businessman there are many do’s and don’ts when it comes to business. Do you have any advice that you would like to share with any up-and-coming business entrepreneurs or those who are seeking to thrive in business? FF: Hey, the only advice that I can say to people that are seeking a business or are trying to get into the business is…once you do get into the business have the right people behind you to run your business. If you don’t have the right people behind you to run your business, your business is going to flop and its going to fall down. AR: Flav, we definitely are a real positive awareness publication. Me, like yourself being an African-American, I know you overcame a lot of adversities. What would you say to the youth that could give them some inspiration when they read this article? FF: The only thing that I can say to the youth is man, if you want the right things in life, you have to do the right things in life. You can’t do the wrong things in life and expect the right things in life. It’s just not going to happen. You gotta love yourself. Also, you gotta love others too. [I’m going to] tell you something man. It all starts within yourself. You can be your best friend and you could also end up being your worse enemy like Flav was when I was on drugs. I was my best friend. Then I was my worse enemy, because of what I was doing to myself. The worse mistake that I could have made was experimenting with drugs. You know what I’m saying! The best part about that whole thing is how I corrected my mistake, and now I’m sitting on this phone talking to you about it today. Stay away from the things that you don’t want to do in your life. AR: Would you like to add anything else before we close the interview? FF: Yea, I want everybody to make sure that they check out my Flav’s spirit. I got my vodka out right now. It’s called Le Flav Straight Up. I’m coming out with a Le Flav’s Tequila. Then also I’m coming with the non-alcoholic beverage Chateaux Le Flav for a lot of the people that don’t drink alcohol. So, I gotta have a non-alcoholic drink, you know for the non-alcoholic drinkers. AR: Great, great! And Flav, I want this article to be special, as far as with [you as a] business owner and highlighting you in a positive way. In the future, I definitely want to do an article pin pointing your music and some of the endeavors you’ve been involved with as a reality TV star. FF: Yes definitely. But hey, you know what I want you to do though! Let everybody know right now as you and me [are] speaking on the phone, [that] me and my partner Carlton (Chuck D)…we recording the next Public Enemy album right now. Also, I’m coming out with a solo album as well. And you guys should have this by July or August. AR: You and Chuck made a difference in my life and that’s what I believe helped generate Consciousness. You are guys the pioneers and I love you to death. Just letting you know that. FF: And the love comes right back to you tenfold brother. Trust me man. And I really thank you man and appreciate you being on the phone this time and taking out the time man, to share some things with me bruh. FF: Yo! Thank you man for having and taking this time like I said my brother and word up! For any more, just holla at me. I got it for you.